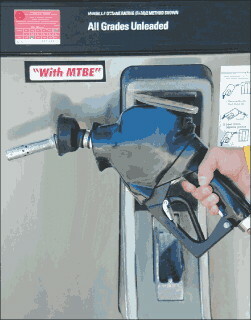 MTBE (methyl tertiary-butyl ether) is a common additive in gasoline. It's added to help reduce emissions from gasoline-powered engines. Photo Credit: Image from USGS Fact Sheet 2004-3119. U.S. Geological Survey (USGS) scientists have discovered that the atmosphere is a potential source of the low concentrations of methyl tert-butyl ether (MTBE) detected in shallow ground water in southern New Jersey. The scientists measured atmospheric concentrations of MTBE from November 1996 to February 1998 and determined through the use of computer simulation studies that the concentrations were high enough to cause detections in ground water, lakes, and streams. In subsequent work the scientists studied the presence of MTBE in the unsaturated zone and discovered that biodegradation of MTBE in the unsaturated zone may reduce MTBE concentrations before they can enter ground water. Variations in the properties of the unsaturated zone and the recharge of ground water need to be more fully understood, however, to determine the potential of the atmosphere as a nonpoint source of MTBE to ground water. Resource managers when conducting surveys of ambient ground-water quality can use the information from these studies to put the presence of MTBE in ground water at low concentrations into context with other contamination sources. "Even when concentrations of VOCs in groundwater are low compared to regulatory concentration limits, it is critical to know the source. If the VOCs originate from a point source(s), concentrations in groundwater could potentially increase over time to levels of concern as groundwater plumes evolve, whereas if the atmosphere is the source, then groundwater concentrations would be expected to remain at low-level concentrations not exceeding those in equilibrium with atmospheric concentrations." Nonpoint-source pollution is one of the biggest threats to the quality of the Nation's ground waters. Volatile organic compounds (VOCs), such as MTBE, benzene, chloroform, and trichloroethylene (TCE) are frequently detected in ground water. Land-use planners are faced with difficult decisions concerning development of land and the protection of ground water from these contaminants. Fundamental to developing sound land-use policies is understanding what role the unsaturated zone plays in protecting shallow ground water from contamination due to land-use activities (residential, urban, agricultural), and whether or not the frequent occurrence of VOCs is due to the coalescing of unidentified point-source plumes, the improper disposal of used motor oil, the flushing of contaminants from the atmosphere during rain storms, or some other mechanism. The above studies of the fate of MTBE have increased the knowledge of potential sources of MTBE in ground water and the role of the unsaturated zone in protecting ground water. This understanding can be used by land-use managers to develop sound policies. These studies were a joint project between the Toxic Substances Hydrology and the National Water-Quality Assessment (NAWQA) Programs. Baehr, A.L., Charles, E.G., and Baker, R.J., 2001, Methyl tert-butyl ether degradation in the unsaturated zone and the relation between MTBE in the atmosphere and shallow groundwater: Water Resources Research, v. 37, no. 2, p. 223-233, 2000WR900292, doi:10.1029/2000WR900292. Baehr, A.L., Stackelberg, P.E., and Baker, R.J., 1999, Evaluation of the atmosphere as a source of volatile organic compounds in shallow groundwater: Water Resources Research, v. 35, no. 1, p. 127-136, 1998WR900030, doi:10.1029/1998WR900030. Pankow, J.F., Thomson, N.R., Johnson, R.L., Baehr, A.L., and Zogorski, J.S., 1997, The urban atmosphere as a non-point source for the transport of MTBE and other volatile organic compounds (VOC's) to shallow groundwater: Environmental Science and Technology, v. 31, no. 10, p. 2821-2828, doi:10.1021/es970040b.